The Mexican impression is one of the "hottest" opportunities in quick-service marketing. While the market is saturated with outlets for hamburgers, sandwiches, pizza and other quick-service menus, TACO MAYO offers a unique variety targeted toward a Tex-Mex-hungry population. TACO MAYO proudly serves a varied menu of classic favorites such as crispy and soft beef tacos, tostadas, bean burritos, potato locos, and fresh grilled quesadillas, but also our new Fresh Mex create-your-own, Burritos, Nachos and and Taco Salads. All of our items are created under strict quality control guidelines that require the finest, freshest ingredients. For Your Information: MAYO (pronounce My-oh) is defined as an abbreviation of a word “Maypole”. It is more commonly known as the Spanish word for the month of May. WHY A TACO MAYO FRANCHISE? 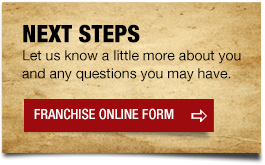 Important reasons for you to become a member of the TACO MAYO franchise universe. You get the full benefit of the attention of a team of experts who will aid you in every detail. You save money! TACO MAYO employs central purchasing and distribution economies of proprietary and non-proprietary products. This network creates volume-buying savings that are reflected in food, paper and other supply costs. It is also important to note that TACO MAYO uses proprietary products made to TACO MAYO specifications and formulas. This approach ensures systemwide product quality and consistency. It is also more cost-efficient. You will, in most cases, belong to an active advertising/marketing co-op, where each member contributes 3% toward an on-going television and radio presence. Expert marketing creates promotions during the year to help you boost sales and reach out to new customers.TACO MAYO creates and produces national quality advertising that ranges from radio and television commercials to point-of-purchase to printed pieces for direct mail/inserts. You will receive monthly newsletters, which include operational and marketing information to let you know how you and the entire system are doing. TACO MAYO has created a highly marketable concept. It's a concept based on combining consumer demand for convenience and value with delicious made-to-order products. We capitalize on the current low market penetration of any kind of quick service Tex-Mex restaurants. You are not battling the huge number of hamburger stores. Thus, you get both a great marketplace opportunity as well as the opportunity to be a part of a proven success. TACO MAYO people will assist you with everything from site selection to real estate acquisition and development whether your interests are in a large metro area, a small town or near a shopping center. Opportunities are available for you to become a single unit or multi-unit area franchisee. TACO MAYO restaurant buildings are freestanding units, approximately 2,200 square feet with drive-thru service. Typically, buildings are built on lots between 17,000 – 25,000 square feet. Prototype plans for freestanding units are available once a candidate has been qualified and has decided to continue in our franchise-licensing program. It is also acceptable to remodel a facility that you may own, buy or lease. The restaurants, for their success, depend upon serving a large number of customers and generally should be located in a market area with a population in excess of 10,000 people, (although, the restaurant can, under some circumstances, succeed in market areas with populations not in excess of 10,000 people). The initial, minimum financial requirement is $250,000 in net worth and a minimum of $120,000 in unencumbered, liquid assets. It is possible for qualified applicants to arrange financing through the Small Business Administration. If you like, TACO MAYO representatives will assist with your business plans and presentations to financial institutions. You benefit from one of the lower franchise fees in the industry, $20,000. This fee includes up to six weeks training for four management personnel. At 4%, our ongoing royalties are also among the lowest in the industry. Once you make the commitment to grow with TACO MAYO the full expertise of a highly successful company is focused on your business. TACO MAYO Corporation operates many company stores which means you benefit from proven systems with field support from experienced operations people. Taco Mayo has been Oklahoma's most creative, fun and fresh spot for quick Mexican Food.